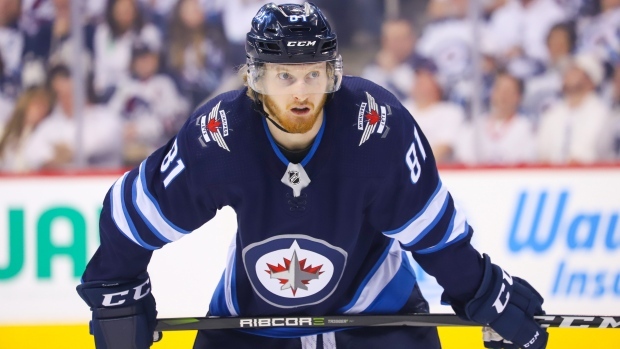 NEW YORK — Winnipeg Jets winger Kyle Connor, Tampa Bay Lightning centre Steven Stamkos and Colorado Avalanche goaltender Philipp Grubauer are the NHL's three stars of the week. Connor had five goals and three assists in four games (three wins) for the Jets last week. He had his first career hat trick in a 5-0 win against the Nashville Predators on Saturday. The 22-year-old has hit the 60-point mark for the first time in his three-year NHL career. Stamkos, a native of Markham, Ont., had four goals and four assists for Tampa last week as the Lightning secured their first Presidents' Trophy in franchise history. Stamkos became the team's career leading goal scorer last week. He is 10th in the NHL with 89 points this season. Grubauer was 3-0-1 with a 1.49 goals-against average and a .961 save percentage last week, helping lift the Avalanche into the final wild-card spot in the Western Conference.